Following the realization that design was more hobby than life’s passion, Santos dove into the culinary arts approaching chefs and establishments to help him learn the craft. 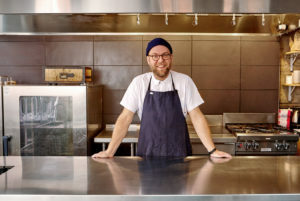 Drawn to the visceral nature of Scandinavian cuisines, Santos left the Cleveland culinary scene to train at Kadeau in Copenhagen. Upon his return to the states, he worked as a sous chef for John Shields who went on to open the Michelin-starred restaurant, Smyth, in Chicago. Santos returned to his beloved Cincinnati to birth Please, which opened in November 2016. Please is the brainchild of Ryan Santos, chef/owner, who sought to bring a fresh vision for new American cuisine. The restaurant features 30 seats and a garden bar nestled in Cincinnati’s historic neighborhood of Over-the-Rhine. The menu reflects a high-low mentality where foraged finds employing modern techniques feature flavors inspired by French, Japanese and new American cuisines.